Powers/Abilities: Lady Green possessed great wealth and consider power via her rank within the Inner Circle of the Hellfire Club. She had servants, most notably Jarvis, to care for her every need, and she had men willing and able to kill for her. She may have been an experienced equestrian, skilled in hunting via trained dogs and willing to stab a wounded animal (or possibly a person) as the coup de grace following it being grounded by the dogs (see here). Weight: Unrevealed; perhaps 135 lbs. (X-Men I#125 (fb) - BTS / X-Men I#129 (fb) - BTS) - Lady Grey likely originated in England (see here). (X-Men I#126 (fb) - BTS) - Lady Grey may have participated in stag hunts, and she may hosted such hunts on her own manor along with her lover. She may have on at least one occasion arranged the hunt of a human in some form/costume (see here). (X-Men I#129 (fb) - BTS) - She likely took a ship to America, perhaps with her fiance (see here). (X-Men I#130 (fb) - BTS) - She may have been crowned the Black Queen of the Hellfire Club following the conclusion of her marriage, which may have occurred in front of Hellfire Club members at a desecrated church (see here). (X-Men I#132 (fb) - BTS) - She may have enjoyed ballroom dances at the Hellfire Club with her husband (see here). (Official Handbook of the Marvel Universe A to Z: Hellfire Club entry (fb) - BTS / X-Men: Hellfire Club#2 (fb) - BTS) - The American Revolutionary War saw an Inner Circle to the American branch of the Hellfire Club form, led by the Black King (Sir Patrick Clemens), Black Queen (Jean, Lady Grey), Red King (Commander George Clinton), and Red Queen (Lady Diana; Diana Knight). Unlike Francis Dashwood, founder of the original, British branch of the Hellfire Club, who supported the American colonies' emancipation, the American branch viewed the American rebels as traitors and sought to covertly assist the British war effort; they hoped to bring down the newly formed American government, restoring the colonies to British rule. 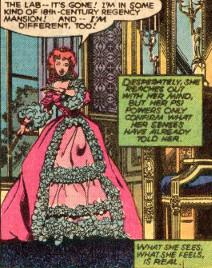 (X-Men: Hellfire Club#2 (fb) - BTS) <1780> - A Tory dissident, Lady Grey, at least, worked out of a Hellfire Club estate outside Philadelphia. (X-Men: Hellfire Club#2 (fb)) - As her horse-drawn carriage drove down Philadelphia's streets, Lady Grey observed the young waif Elizabeth Shaw and instructed her driver, Jarvis, to stop the carriage. After Elizabeth fled a failed attempt to steal an apple from a street vendor, Lady Grey approached Elizabeth as she gazed longingly at some dresses through a window. Lady Grey spoke to her on the values of dreams, asking who was more foolish, the dreamer who chased and failed or the dreamer too afraid of the chase to even try. When Elizabeth nervously asked if she could be of some service, Lady Grey, showing her an apple (which she either already had or obtained from a vendor), told the young girl, "Actually dear, I believe I can be of service to you." (X-Men: Hellfire Club#2 (fb) - BTS) - Elizabeth boarded Lady Grey's carriage. 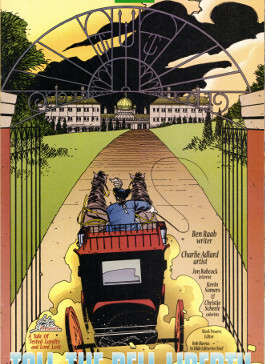 (X-Men: Hellfire Club#2 (fb)) - The carriage arrived at the Hellfire Club estate. Inside the mansion, Lady Grey told Elizabeth of the Hellfire Club, describing both its hedonist aspects and its local, global, and national influence. After Grey told Elizabeth of the importance of apprenticeships to the club and asked what fires burned in her heart, Elizabeth answered, "Freedom" (meaning freedom from being poverty's slave). Grey welcomed her to the Club. (X-Men: Hellfire Club#2 (fb) - BTS) - Lady Grey arranged for Elizabeth to seduce Major-General Wallace Worthington with the goal of learning military secrets he would have (as Worthington was replacing the traitorous Benedict Arnold as Philadelphia's commandant). (X-Men: Hellfire Club#2 (fb)) <Six months later> Lady Grey met with the rest of the Hellfire Club's Inner Circle -- Sir Patrick Clemens, Commander George Clinton, Lady Diana -- at the Hellfire Club mansion. She greeted them as friends, but Clinton told her to dispense with the pleasantries and asked if Worthington had arrived. When Patrick (or Clinton, it was too distant to confirm who asked) noted that Worthington was one of the colonies' most patriotic soldiers and would never betray his country, Grey replied that despite Worthington's recent appointment, his financial status was presently "embattled," which left him vulnerable. Lady Diana asked how Grey proposed to exploit this weakness, and Grey shared that a woman's touch could turn the tides of a man's heart. Elizabeth swiftly gained Worthington's ardor, and the two shared a dance. (X-Men: Hellfire Club#2 (fb) - BTS) - Following a whirlwind courtship, Elizabeth married Wallace Worthington. (X-Men: Hellfire Club#2 (fb) - BTS) - Elizabeth's ambitions died as she fell truly in love with Wallace. (X-Men: Hellfire Club#2 (fb)) <December, 1781> - On a bitter night, Lady Grey chastised Elizabeth for falling in love with Wallace and failing to gain his military secrets. Grey warned that, without these, the American revolution would succeed, and Elizabeth, would have all of her "puppet strings" cut. As she walked out of the room, she told Elizabeth, "such is the price of freedom." Soon thereafter, as Wallace had heavily partaken of liquor and snuff while waiting for his friend Captain Steven Rogers to show up, Lady Grey -- accompanied by a pair of powerful men --knocked on the door. She stated that she had come to collect his wive's debt, and her two agents then attacked and beat Worthington. (X-Men: Hellfire Club#2 (fb)) - As Elizabeth arrived, Captain America (Rogers) burst from the burning house carrying Worthington, who died in Elizabeth's arms. Grey watched from her carriage with a smile. Confirmed as a real person and used in a story by Ben Raab and Charlie Abalard. We don't know for whether Lady Grey had any children, so we don't know for sure that Jean and the others are her direct descendents. The handbooks list her as an ancestor for Jean Grey of the X-Men, but it could just be an abbreviation to cover common ancestry. My ASSumption is that she is Jean Grey's direct ancestor. Dorcas Farkas. OK, in X-Men I#125, while trying to prove himself as an applicant to the Hellfire Club's Inner Circle, Mastermind started using a Mindtap Mechanism designed by the White Queen (Emma Frost) to influence the thoughts of Phoenix (the Phoenix Force in the form of Jean Grey, although at the time of the story, it was supposed to be Jean herself empowered by the Phoenix Force). Mastermind's influence caused Jean to believe she was slipping back into the form of her 18th century ancestor, Lady (Jean) Grey who was in love with Jason Wyngarde, a gentleman rogue (and a knight of the realm, as well as a member of the Hellfire Club) form taken by Mastermind. In X-Men#122, Mastermind, in his Jason Wyngarde form, had previously arranged a chance meeting with Phoenix/Jean while she was in Scotland. In X-Men I#125, he made an illusion for himself of Jean Grey as the Black Queen, which is the form she took in the illusory(?) scenario in X-Men I#130 before adopting it in reality in X-Men I#132. I'll cover these "illusion" appearances and then discuss further below. (X-Men I#125) - As Phoenix searched the Muir Island Research Facility for a panicking Moira MacTaggert, who had just discovered that her son, Kevin (later known as Proteus), had escaped from his containment cell, she suddenly found herself in an 18th century regency mansion. Her hairstyle, dress, etc. matched that era (and she stated, "I'm different, too," perhaps indicating that she appreciated that she was actually a different person; or maybe she was just referring to her dress, hair, etc.) and a psi-scan told her what she saw and felt was real. She was baffled for a few seconds before, her actual Phoenix form in the real world was tackled by a Proteus host, snapping her mind back to reality. 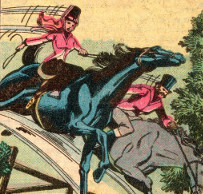 (X-Men I#126) - The next day, as Phoenix flew over the countryside in search of Proteus, she suddenly found herself seemingly transported back into her 18th century ancestor, riding her black stallion, Satan, in experienced fashion alongside Jason Wyngarde and a pack of hounds in a stag hunt. Phoenix/Jean found herself accepting and welcoming this reality where she was Lady (Jean) Grey, this was her manor, the men her guests, and Jason her love. Outstripping the other hunters, Jean reined in Satan and called to Jason to call the dogs off the fallen prey. Jean's pulse quickened at the site and sound of Jason, with her thoughts turning to the days and nights to come. After Jason drove off the hounds, he told Lady Grey they were fortunate as the beast still lived, and that, as the first to run it to ground, to her went the honor of administering the coup de grace. Having dismounted, Jean thanked Sir Jason and took the dagger he handed her. As she approached, Jason noted that he couldn't remember having had finer sport and complimented her on the masterstroke of suggesting they hunt a man playing the part of a stag, rather than the animal itself. Stunned at seeing the fallen man, Phoenix/Jean reverted to reality, where she had come upon a corpse that had been drained by Proteus. (X-Men I#129) - With Proteus defeated, the X-Men headed home in their Blackbird ship, rapidly overtaking a Hellfire Club jet carrying Mastermind. Mastermind concentrated, and Phoenix/Jean opened her eyes to find herself once again seemingly back in her 18th century form, this time in a cabin aboard a ship en route to America with Sir Jason, the man she loved and would soon marry. This time Phoenix/Jean remained disoriented and resisted fully accept that reality. Jason comforted her, telling her he knew they had had a rough passage, but they would soon be in New York, where she would be his forever. Though nearly overcome by the intense emotions stirring within her, Jean broke away from Jason's embrace, telling him her head ached and she wished to have a breath of fresh air on the ship's deck alone. Jean scoured the ship with her psychic powers, which seemed to confirm this to be reality. She was surprised that these timeslips, which she had assumed to have been caused by the reality-altering Proteus, were continuing, and she realized she was mistaken. She further wondered whether she was actually psychically shifting in time, reliving the life of one of her ancestors, perhaps via the Phoenix's power. As she worried about the timeslips occurring more frequently and about what might happen if her mind was trapped in the past, the ship's captain approached her, and she recognized his voice as that of Scott Summers (Cyclops, her lover); this caused her to snap back to reality once again. Cyclops recognized that something was troubling her, but she refused to talk about it. (X-Men I#130) - As Cyclops and Phoenix, in street clothes, visited a disco club off Delano street in search of a mutant identified by Cerebro (who turned out to be Dazzler/Alison Blaire), Mastermind, in his Jason Wyngarde form, reintroduced himself to "Jean." As she recognized him and their eyes met, her mind again seemingly shifted into her 18th century self, and she found herself in a wedding gown inside a burned-out church in a woodland glade that would one day become part of fifth avenue. This time, Jean/Phoenix didn't try to fight her way out of the past, insteading accepting what was happening as she was led to the altar and her waiting husband-to-be; as always, his "manly beauty" took her breath away. The vicar -- who had a face identical to the modern day Sebastian Shaw's -- began the marriage ceremony, and it took all of Jean's will to stand demurely and listen to the service when she wished to be in Jason's arms. After both Jason and Jean agreed to the terms of marriage, the vicar -- his obsidan eyes glowing with an eerie, darkling light -- finished the ceremony, pronouncing them man and wife and telling Jason he may now kiss the bride. As he lifted the veil, Jason told Jean she was now his, bound to him till the end of time; and Jean assured him that she would not have it any other way. As he then pulled off the robe/gown, Jason presented to the gentlemen and ladies of the Hellfire Club present thier new Black Queen, "Long may she reign!" The ruined, desecrated churchyard exploded with cheers, but Jean heard none of them, as every facet of her being was overwhelmed by a physical and emotional tidal wave, the like of which she had never known. Then, as abruptly as it began, the timeslip ended, and Jean/Phoenix was shocked to find herself kissing Wyngarde; observing this kiss, Scott was shocked as well. As "Jean" turned to Scott to try to explain, they were distacted by the entrance of the Dazzler, and Wyngarde slipped away. (X-Men I#132) - X-Men members Colossus, Cyclops, Phoenix, and Storm attended a Hellfire Club party in civilian garb, but Scott Summers and "Jean Grey" were recognized. As the latter two danced, Mastermind, in his Wyngarde form, asked to cut in, and as swept "Jean" away, he reached into her mind and sent her back into her 18th century persona/existence once again. Lady Jean danced with the man she loved more than life itself. Mirroring reality, Wyngarde escorted Jean upstairs, and as Cyclops followed, Wyngarde allowed his illusory form to lapse, taunting Cyclops that he was Mastermind. However, by the time Cyclops caught with him, Jean was now fully overcome with her 18th century Black Queen/Lady Grey persona, striking down the man pursuing herself and her lover. 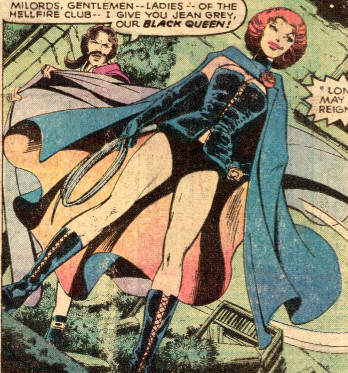 The Black Queen subsequently enjoyed seeing the defeated X-Men at their feet, and their members, as well as "Wyngarde," toasted their new Black Queen: "Long may she reign!" (X-Men I#133) - Still existing as the Black Queen, Phoenix saw her captured former teammates as 18th century, non-superhuman equivalents. When Storm spoke up, invoking their friendship, the Black Queen slapped her across the face with a coiled whip, chastising a "slave" for speaking to her thusly and instructing her that she was not her friend, but her mistress; "and -- as my right -- mine will be the hand that ends your worthless existence." 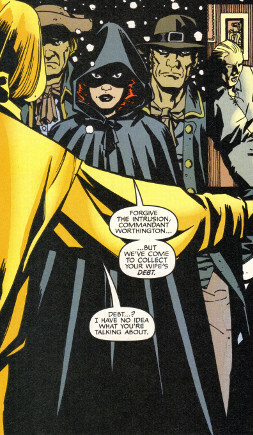 When Cyclops connected to "Jean" via their psychic rapport, she found his voice vaguely familiar, but noted that his garb marked him as an American rebel, King George's enemy and therefore hers. She warned that her husband would cut him down, but Cyclops engaged Wyngarde, who then"killed" Cyclops in a fencing duel. (X-Men I#133 -BTS / X-Men I#134 (fb) - BTS) - Though Cyclops did not truly die, seeing Wyngarde seemingly kill her lover shocked Phoenix out of the illusion, and she regained her will. (X-Men I#134) - Phoenix freed Cyclops, allowing him and the other X-Men to take down the Hellfire Club. Phoenix drove Mastermind mad, but her own experiences perpetuated her own madness, and she transformed into Dark Phoenix. (Uncanny X-Men I#170) - In a scenario mimicking that from X-Men I#126, Lady Grey led her black stallion to first reach the fallen prey in a hunt. This time, however, the prey was Mystique, and "with a smile of pure joy," Lady Grey slashed her prey's throat. Mystique then awoke from the nightmare illusion Mastermind had projected into her. 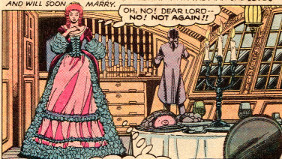 Comments: The illusions when they occurred seemed to reference a possible ancestor, and that was that...until X-Men: Hellfire Club showed Lady Grey in the Hellfire Club's Inner Circle circa 1780, which then confirmed the earliest illusion as at least a behind-the-scenes appearance of Lady Grey. We don't really know how much, if at all, the illusions mimicked the past/life of Lady Grey. Mastermind was not limited to his normal illusion abilities, as he had the Mindtap mechanism designed by Emma Frost. The Hellfire Club itself may well have detailed records on the life of Lady Grey that Mastermind was able to access. It's also possible that Phoenix could actually tap into information from the past or possibly even access the memories of Jean's ancestor(s) via the astral plane, or something. Regardless, whether the scenarios were similar, obviously the conscious thoughts of Jean and the psychic manipulations making her love Wyngarde were not representative of how Lady Jean experienced things. I'd say everything is possible, but nothing is confirmed. Lady Grey likely originated from England. She may have been an experienced equestrian. She may have participated in stag hunts, and she may hosted such hunts on her own manor. She may have on at least one occasion arranged the hunt of a human in some form/costume. She likely took a ship to America, perhaps with her fiance. She may have been crowned the Black Queen of the Hellfire Club following the conclusion of her marriage. Her marriage likely took place at the abandoned churc in which Sir Patrick Clemens and Lady Diana (Diana Knight) founded the Club’s New York chapter after immigrating to America. 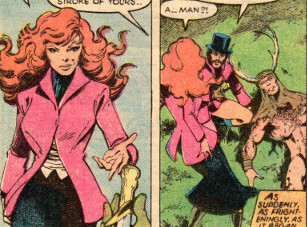 Her fiance may have been Sir Jason Wyngarde, a Hellfire Club member. When the original story was told, the name and form of Jason Wyngarde were adopted by Mastermind, whose real name remained unrevealed. X-Men I#138, however, noted Wyngarde to be his real name (his handsome disguise was based on actor Peter Wyngarde, who at that time had recently played a character named Jason King; Byrne combined both names to create Mastermind's name). Regardless, Mastermind could have taken that name for himself, or they could have both had the same name...stranger coincidences have happened. Or, Mastermind may have placed his own name into the illusory scenarios, but taken the form of Jean's ancestor's lover/fiance/husband. Mystique's nightmare most likely represented Mastermind recycling a horrific scenario for Mystique's "benefit." Mystique is supposed to have been an adult around 1900, but I don't think we've got any evidence she was around in the 1770s. Do we? Additionally, Mastermind's attack on Mystique was intended as revenge for her previous attempt to swindle the Hellfire Club; that information was not revealed until Marvel Super-Heroes III#11/3 (1992). Alright...this is a complicated scenario, and I'd imagine there is more to discuss, but that's all I've got for now. Lady Grey rode her (two) horse-drawn carriage, guided by her servant Jarvis, when traveling to and from the Hellfire Club mansion, into town, etc. She used this carriage when observing Elizabeth Shaw and when subsequently taking Elizabeth back to the Hellfire Club. When Sir Patrick, Lady Diana, and Commander Clinton arrived for a ball at that Hellfire Club, Jarvis greeted them and held the door as they exited their carriage. He also advised them that Lady Grey awaited their arrival in her parlor. When Sir Patrick asked him to have a snifter of their best brandy sent up to his private quarters as Ms. Knight enjoyed a good nip after their...liaisons, Jarvis bowed his head and told him he had already taken care of it. He can also be seen in profile the sub-profile for Sir Patrick. Jarvis was presumably a long-standing employee of the Hellfire Club, as Sir Patrick, at least, knew him by name. There is no information to support nor to exclude Jarvis from being an ancestor of Edwin Jarvis, the butler of the Avengers. Both are of British origin, but Jarvis is a common enough name. (Official Handbook of the Marvel Universe: X-Men 2005: Hellfire Club entry) - In the 1770s, British Hellfire Club members Sir Patrick Clemens and Lady Diana (Diana Knight) immigrated to North America, where they founded the Club’s New York chapter in an abandoned church located on what is now Fifth Avenue on Manhattan’s East Side. (Official Handbook of the Marvel Universe A to Z hardcover: Hellfire Club entry) - Their club opened its doors wider to the upper echelons of society, reinventing itself as a risqu� but acceptable place to be seen. (Official Handbook of the Marvel Universe A to Z: Hellfire Club entry (fb) - BTS / X-Men: Hellfire Club#2 (fb) - BTS) - The American Revolutionary War saw the formation of an Inner Circle to the American branch of the Hellfire Club, led by the Black King (Clemens), Black Queen (Jean, Lady Grey), Red King (Commander George Clinton), and Red Queen (Diana). The American branch viewed the American rebels as traitors and sought to covertly assist the British war effort; they hoped to bring down the newly formed American government, restoring the colonies to British rule. (X-Men: Hellfire Club#2 (fb) - BTS) - Clemens accompanied Diana and Commander Clinton to the Philadelphia Hellfire Club estate to meet with Lady Grey and discuss plans to gain secrets from Major-General Wallace Worthington, who had been promoted to replace the traitorous Benedict Arnold. 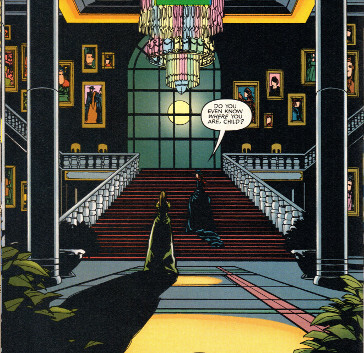 (X-Men: Hellfire Club#2 (fb)) - When Sir Patrick, Lady Diana, and Commander Clinton arrived for a ball at that Hellfire Club, Lady Grey's servant, Jarvis, greeted them and held the door as they exited their carriage. He also advised them that Lady Grey awaited their arrival in her parlor. Sir Patrick asked Jarvis to have a snifter of their best brandy sent up to his private quarters as Ms. Knight enjoyed a good nip after their...liaisons, and Jarvis bowed his head and told Sir Patrick he had already taken care of it. Upon meeting with Lady Grey, Patrick (or Clinton, it was too distant to confirm who asked) noted that Worthington was one of the colonies' most patriotic soldiers and would never betray his country, Grey replied that despite Worthington's recent appointment, his financial status was presently embattled, which left him vulnerable. Lady Diana asked how Grey proposed to exploit this weakness, and Grey shared that a woman's touch could turn the tides of a man's heart. (X-Men: Hellfire Club#2 (fb) - BTS) - The Inner Circle watched as Grey's apprentice, Elizabeth Shaw, gained Worthington's attention and the two danced. Although Shaw and Worthington married soon thereafter, Elizabeth fell in love with her husband and was unable to betray him. Grey brought a pair of strongarms to Worthington, fatally injuring him when he refused to divulge his secrets. Note: Sir Patrick is central, arm-in-arm with Lady Diana, on the right. 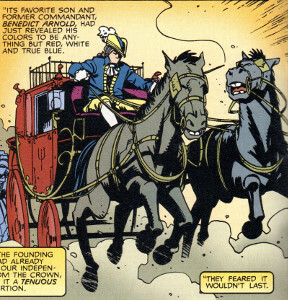 Commander Clinton is getting out of the carriage, assisted by Jarvis. Clemens' surname was revealed in the Official Handbook of the Marvel Universe: X-Men 2005: Hellfire Club entry. (Official Handbook of the Marvel Universe A to Z: Hellfire Club entry (fb) - BTS / X-Men: Hellfire Club#2 (fb) - BTS) - The American Revolutionary War saw the formation of an Inner Circle to the American branch of the Hellfire Club, led by the Black King (Sir Patrick Clemens), Black Queen (Jean, Lady Grey), Red King (Clinton), and Red Queen (Lady Diana; Diana Knight). The American branch viewed the American rebels as traitors and sought to covertly assist the British war effort; they hoped to bring down the newly formed American government, restoring the colonies to British rule. 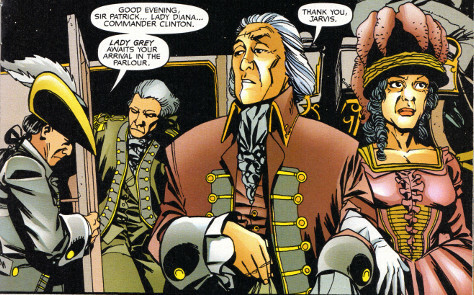 (X-Men: Hellfire Club#2 (fb) - BTS) - Clinton accompanied Lady Diana and Sir Patrick Clemens to the Philadelphia Hellfire Club estate to meet with Lady Grey and discuss plans to gain secrets from Major-General Wallace Worthington, who had been promoted to replace the traitorous Benedict Arnold. They met with Lady Grey, who greeted them as friends, but Clinton told her to dispense with the pleasantries and asked if Worthington had arrived. Patrick (or Clinton, it was too distant to confirm who asked) noted that Worthington was one of the colonies' most patriotic soldiers and would never betray his country, Grey replied that despite Worthington's recent appointment, his financial status was presently embattled, which left him vulnerable. Lady Diana asked how Grey proposed to exploit this weakness, and Grey shared that a woman's touch could turn the tides of a man's heart. It is uncertain what Clinton was Commander of. Was he a British soldier? Was he a traitorous American soldier loyal to the British? Sir Patrick asked Jarvis to have a snifter of their best brandy sent up to his private quarters as Ms. Knight enjoyed a good nip after their...liaisons, and Jarvis bowed his head and told Sir Patrick that he had already taken care of it. There is no information to support nor to exclude Diana Knight from being an ancestor of Mercedes "Misty" Knight of the Daughters of the Dragon; or to any other Knight characters. Diana has a darker complexion, but whether she is fully black, white, or somewhere in-between, that's not really an exclusion. On a massive estate only a carriage drive from Philadelphia, the mansion served as the base of Lady Grey, the Black Queen of the American Hellfire Club. In 1780, Lady Grey brought Elizabeth Shaw to the mansion, impressing her with its opulence, and convincing Shaw to become her apprentice in exchange for enjoying the Club's vast wealth and influence. Six months later, Lady Grey held a ball, attended by her fellow Inner Circle members, in which she arranged for Elizabeth to gain the attention of Major-General Wallace Worthington and to encourage the development of a romance. At that ball they had their first dance, and the ensuing romance swiftly led to a marriage; Grey planned for Elizabeth to learn Wallace's military secrets from Wallace, but Elizabeth fell in love with Wallace and failed to do so. At the mansion, Lady Grey chastised Elizabeth for her failure and then led a pair of strongmen to try to pry the information out of Wallace, who was mortally wounded by their efforts.